In 2016, Texas A&M wanted to improve the safety of an on-campus intersection that featured high pedestrian, bicycle and vehicle traffic. Part of their solution was to paint the bike lanes in highly visible green paint. 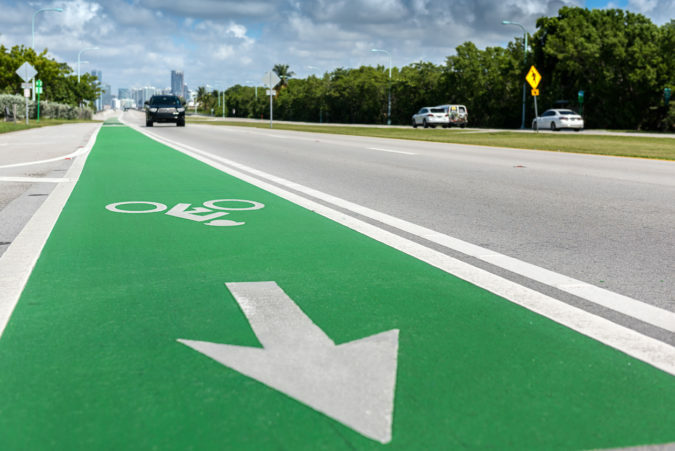 This green paint is not only highly visible in the daytime, but it has a photo luminescent component that glows in the dark, allowing both bikers and drivers to see the bike lanes more clearly, thus increasing safety. Various glow-in-the-dark technologies are now available to businesses, schools and homeowners who want to provide light but save electricity. CORE Glow Pebbles by CORE landscape products need only a few minutes of sunlight in order to offer 10-12 hours of glow-in-the-dark luminescence. The pebbles are eco-friendly, bright, waterproof and come in four colors. Learn more at https://www.coregravel.ca/core-decor/core-glow/. Starpath-Pro by Pro-Teq Surfacing is a coating that can be applied to virtually any pavement material. It also provides a non-slip surface. The coating was applied to a park path in Cambridge, England. The 140-meter-long path took about four hours to cover. Photo luminescent exit signs are also available. These signs use zero electricity and are certified by the UL to be NFPA compliant. Since some facilities use hundreds of powered exit signs, this solution can save a ton of electricity. According to one sign provider, LumAware, these signs qualify for three different LEED credits: EA, MR and ID. LumAware also offers egress and safety products, like an adhesive strip, so you can highlight staircases and handrails. Such glow-in-the-dark solutions not only save electricity but offer back up illumination in case of loss of power, which is likely in case of fire or other emergency. For more information on these and other eco-friendly lighting solutions, contact Vanguard Resources.